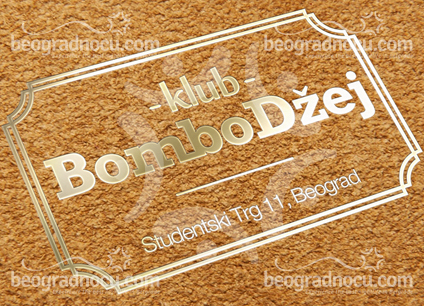 Club Bombo Džej is a unique place, for night life in Belgrade, and it’s located in No 11 Studentski Trg Street. What can you expect in this club, best tells the fact that the owner of this remarkable club iz Džej Ramadanovski. He is a synonym for fun, positive energy and he is always in good mood. Renovated club Bombo Džej, is even more adjusted to your good time. When we speak about this club it’s hard to describe it with just words. It is also important to mention team of people gathered about this club, a lot of professionals from various fields, who are constantly contributing to the whole concept of this great club. We should also mention, the guests, who are important part of Bombo Džej. Music direction in this club is mainly pop and folk, although you can hear everything that is popular among young people. Management of this club has a great respect for all the guests and they are making a great effort to make their stay unforgettable. Club Bombo Džej presents most beautiful and most cheerful side of Belgrade, and you will undoubtedly fall in this club for the first visit. As we mentioned, the service is very professional and ready to fulfill all you desires at any time. The certain thing about Bombo Džej club is that you will not have any remarks, because everything about this place is just perfect. The interior of this club is very modern and subordinate to you mood. As the host of this club is Džej, a great expert in music, acoustic of this club is on a very high level. In this club, there is no bad position for a DJ, as well as for guests. Be a part of this club in all of its glory.